The fastest way to cut a few inches off your midsection. | Richie Mishal, World's Best Nutritionist. »Ask Richie»The fastest way to cut a few inches off your midsection. Ah, you know what Adel? If l had a dollar for every time l’ve been asked this question. I would be building a house in Palestine. Of course, the fastest way to get rid of your “love handles” would be liposuction, but l am guessing you came to me for an answer because you’re probably looking for something a little less extreme, so here’s a few ways to achieve your fitness goal. 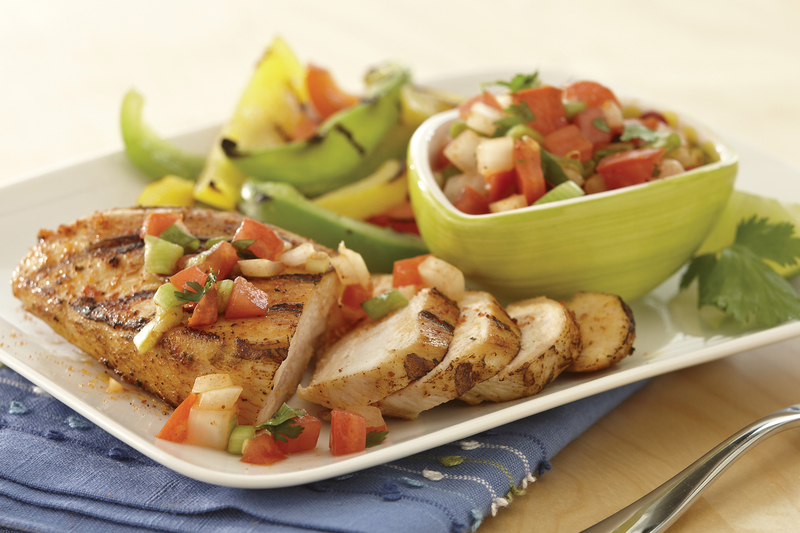 Grilled Chicken with pico de gallo—A food high in protein. Replacing some of your carbohydrate with similar amount of protein have beneficial effects on your midsection. According to a study published in the American Journal of Clinical Nutrition proved my assertion. After 15 weeks on the high protein diet, the overweight subjects in this study maintained more lean mass than their lower protein eating counterparts. This is significant because while both groups lost about the same amount of weight, the group that lost more lean muscle tissue is considerably more likely to gain it all back. Fat tissue is only about 25% as metabolically active, or calorie-burning, as muscle, so losing lean mass starts a self-defeating cycle (overweight /eat less/lose muscle/metabolism slows down/weight creeps back up/overweight again) that makes long-term maintenance nearly impossible. 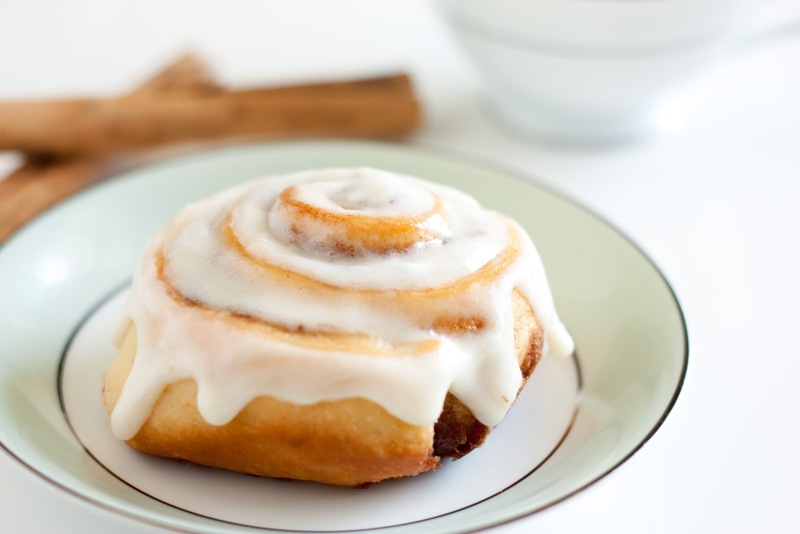 Cinnamon Rolls—Taste great but are full of Junk Carbs. Carbohydrates are the body’s primary fuel source. They’re easily digested, “clean” burning, easily obtained from just about any of the major food groups, and are generally inexpensive. Though no class of carbohydrate is “essential” like certain amino or fatty-acids are, many are beneficial to overall health. Dietary fibers help fill you up and promote regularity. Oliosaccharides serve as a substrate to favorable micro-organisms in the digestive tract, which in turn help enhance mineral and glutamine absorption. Natural, unrefined starches provide energy without significantly taxing or increasing the metabolic load of certain organs. That being said, not all carbs are created equal. Certain types (simple sugars, products made with white flour, corn syrups,etc.) provide little more than “empty” calories. While consuming a few grams of sugar a day, especially immediately following a long workout, won’t kill you, it’s not going to do much to help your gut. Instead, limit sugar consumption to less than 10% of your total daily caloric intake. Don’t know how many calories you should eat each day? 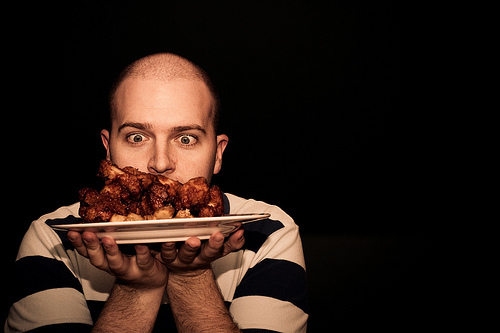 Are your eye’s bigger then your stomach? By now you’re probably noticed a pattern here. I’ve been telling you about diet and hardly any (yet) on exercise. That’s because the formula for great abs is 85-90% diet and only 10-15% exercise. That’s right, just about everyone has good abs, regardless of whether or not they exercise, it’s just that most people’s six-packs are covered by an unsightly “shipping carton” called subcutaneous fat. Lose that and you’re golden. So just how much should you eat to reveal your midsection mogals? Start with about 11 kilocalories per pound of body weight. If after a week, you still haven’t lost anything, bump this down to 9-10 kilocalories/lb. Caution: If you drop your total caloric intake by too much, too quickly, you’re likely to trigger a metabolic slowdown (which is the worst thing that you can do). To determine how many calories are in different foods, read the labels and/or consider purchasing one of the many “calorie-counter” books that are on the market. After a few weeks, you’ll have committed to memory the energy kilocalories content of all of the foods that you eat regularly. When it comes to having a smaller waist, more is better. The midsection muscles are more endurance than power oriented, so they respond well to higher volume training. Strategy: work your abs every day, twice a day, gradually working your way up to 15-20 rep’s per set. Make sure to include at least one exercise targeting the upper abs and one targeting the lower abs. Since you trying to lose midsection size, stay away from exercises that target the muscles on your sides, big obliques will just make your waist look wider. A recent study found that performing crunches on a Swiss exercise ball worked abdominal muscles up to 400% more than similar exercises done on the floor or other flat surface. Four times the benefit from the same amount of work means better abs in 25% of the time. 110% is great when it comes to effort except when that extra effort is coming from the hip flexors rather than the rectus abdominus (six Pack). Yet, this is exactly what happens when you choose bent knee sit-ups man or woman, do them with your legs straight out in front of you. I hope l answered your question fully and completely. Also if you choose to adhere to my instructions, email me with your results. ← Are vitamins a waste of my money? I agree with being flexible. This is down my alley and it works well. It is the same amount of work, but works just as efficiently for me. I think over eating is the hardest thing for most people. I tend to over eat because I feel I am starving myself. But I usually just snack healthy snacks during the day and that helps. My problem is protein. I need to get my protein in my diet, but tend to find other means of eating other foods. Protein is the way to go, but just need to build a habit to do it. You can get off the junk carbs easily. I got off my junk carbs for about 4 weeks and for some reason, because I stayed on an extremely healthy diet, my body no longer craved those junky carbs. Working out I must say is the icing on the cake, you can eat less, eat more healthy, but I believe it is taking the high road is what makes everything complete. I just make sure that I lay off the fatty snacks and eat more healthy foods that will balance the diet. The body was made for a balanced diet. As long as you respect the body, the body will respect you. I have tried just about everything and almost went for a pill. But when I took an inventory of what I was doing, I realized that I need to work out more and to truly balance the diet. It is simple but it works. You guys should look into pinterest for ideas for home made nutritional shakes. My hubby and I have them once a day and it really helps slow down the cravings and increase your desire to get out more. Thanks guys for all these comments, they have been really helpful to me and I am feeling more confident that I can do this. I wish you the very best of luck!! I have no doubts whatsoever that you’ll reach your goals. It sounds like you have a great plan in place. Thank you so much! ❤ I appreciate all your help! These tips can help you get the body you deserve. Don’t expect results instantly, cause there is NO way to get results fast. Anyone claiming to do that is lying. If you want to reduce your midsection you will need to exercise. Don’t worry, the exercises will only take five to ten minutes a day. They are best done first thing in the morning, so they easily fit into your daily routine. Losing inches off your waist is not hard and if you do these tips you will lose inches within no time. All you need to do is regular walking/jogging or cycling or something for 30 mins 3 times a week. You will lose weight gradually. Challenge accepted, my waist is a 28inch but I’m aiming for 24 inch and my wedding is only 2 months away. There are no secrets. Regular moderate excersise, healthy diet, that’s all. I will definitely try this, my waist is 27 inches, and my goal is 24-23. I found this site very funny and I just wanna thanks for that. I hope you keep up the good work!